Unforgettable Guatemala – Speak Out in Spanish! My overwhelming impression of Guatemala is of a warm and welcoming people, in a diverse landscape of jungle, temples, volcanoes, lakes, small, colourful towns and warm Pacific waters. There was so much to see and do. “Guatemala” in the native Nahuatl language means “Place of Many Trees”. We were soon to find out that this luscious green country lived up to its name. We landed in Panama City first, via Schiphol, Amsterdam en route to Guatemala, Central America, after an exhausting flight from Newcastle in the north of England. The airline provided us with details to Panama, but then we caught a connecting flight to Guatemala City, to the north-west of Panama, to begin our adventure and be amazed by the beauty of this lovely country and people. Before long we were hopping on and off tuk-tuks to visit the colourful markets. There was so much to see and buy, and yes, we had a bit of fun haggling over prices! I was so pleased to able to bring home some lovely souvenirs of an exciting trip. The place was bustling with hundreds of locals, intent on getting the best bargain ever and the stall owners intent on getting as much money out of their customers as possible. The din made me dizzy at first, but I soon got used to the deafening chatter and joined in the bartering, almost like a local, although they soon realised my accent in Spanish was from Spain rather than from Guatemala. 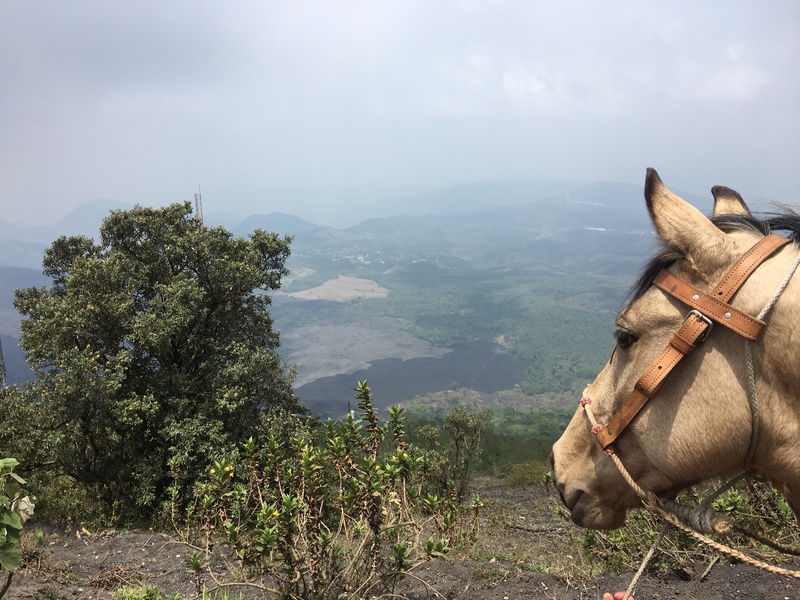 There were some personal challenges along the way, one being ‘walking’ up the Pacaya Volcano and, although I opted to go on horseback, actually getting onto the helpful steed was a bit nerve-racking in itself. The local guide had to take matters into his own hands and unceremoniously hitch me up, while I managed to hold on for dear life. This sorry sight meant that none of my companions chose to go through this undignified procedure (I didn’t blame them). They preferred to risk it on foot! I felt a little guilty for about 30 seconds for taking the lazy way out, but fortunately the feeling soon passed. After a few minutes I was so happy I had chosen the easy option, as I was able to cruise up the side of the volcano and enjoy the surrounding views in what now turned out to be a most dignified and leisurely manner, despite my most undignified start. However, I still felt I deserved the treat of marshmallows toasted in the heat of the actual volcano, at the end of the trail! It really was one of the highlights of the trip. 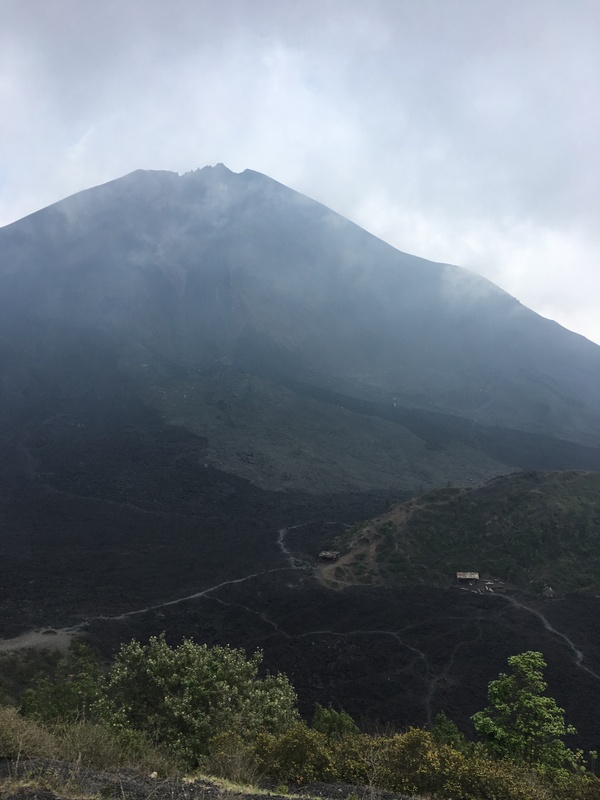 The second physical challenge was when I managed to actually walk up Cerro de la Cruz (The hill of the Cross) in Antigua, the former capital city of Guatemala. Some of my companions managed this one with ease, but guess what? Oh yes, I struggled a little, especially towards the end of the trail. When I got to the top (and could breathe again), I felt very proud of myself for persevering. It had been worth every breathless step. The spectacular views over Lake Atitlán and the volcanoes in the distance made us all feel on top of the world. Literally. One particular highlight for me in the jungle, apart from the deafening calls of the howler monkeys (particularly terrifying at night), was the spotting of a flock of resting toucan. What a sight but what a noise! Moments earlier I had told my companions that I really I wanted to see toucans, so everyone took great delight in my wish being granted. Easter celebrations of ‘Semana Santa’ in Antigua! In Antigua, the Easter Celebrations (Semana Santa) had a wonderful carnival atmosphere as the people prepared their colourful, sawdust ‘carpets’. Local residents spend hours preparing intricate patterns using sawdust dyed in many different shades of deep colour. Sawdust is carefully arranged on the ground to form a ‘carpet’ over which the Easter processions trample! All that work, sacrifice and dedication for an interesting tradition which has been performed in Antigua for years, to pay homage to the all important Easter processions of the city. It was fun ‘having a go’. There are six Mayan temples located in the Tikal National Park, a Unesco Heritage site since 1979. It is one of the most important sites of Mayan culture and is located near the town of Flores, Guatemala. It was wonderful to contemplate these structures and imagine the significant role they played in the lives of their people over one thousand years ago. In my zeal, I wanted to climb to the top of each and every one of them, but was sternly advised by my companions that I really shouldn’t even attempt such a feat. So we had to choose only one temple to climb. The lucky temple was amazing and it was also 65 metres high! Temple IV, of the six Mayan temples at Tikal is known as the temple of 27th king of the Tikal dynasty, Yik’in Chan K’awiil, who is believed to have been buried here. The temple was built in AD 741, over a thousand years ago. This is the impressive sight from the top of Temple IV. From here you can see the tops of the other temples, peeping above the canopy, stretching towards the sun. Accommodation was delightful during our stay in Guatemala. Here are a few pictures of the different types of accommodation we enjoyed on our 10 day trip to this paradisiacal country. We were very fortunate to travel under the wing of a Guatemalan guide, who arranged for us to have as authentic an experience in her country as possible. Our lovely guide organised a typical Guatemalan meal in a real home, with real people! Carmen, our host, is showing us how to make tortillas in her humble kitchen. We discovered it isn’t as easy as it looks when we tried. In this unspoiled country, it was a true honour and privilege to be invited into her home. We enjoyed some typical Guatemalan meal at her table, with her family, right there in that tiny kitchen. She was so proud of having us as her guests! When does that ever happen when you’re travelling? a Guatemalan cooperative run by women, for women, set up in order to help some women become economically independent. We were taken back centuries as the ladies demonstrated medieval weaving and dyeing techniques. We were able to have a try weaving at their looms, which caused great hilarity all round, of course. This was the pretty shawl I purchased for very few ‘quetzals’, the local currency. I know I’ll need it soon ready for winter back home! A wonderful country, a wonderful people full of fun, hospitality and good will. This was truly an experience I could never forget. I hope to return their some day. If not, I still have hundreds more photographs, to help me re-live those magical moments again. Previous Post: 5 ways to kick-start your language learning, fast. Next Post: Listen to the News in Slow Spanish! Thanks for sharing. We were to Guatemala in February and loved it. I’m looking forward to going back some day. Hi Adhoctraveller, sorry for late reply but just noticed your comment on Guatemala now! A wonderful place. I would love to get back there some day, too. Easter. This year? Oh my what lovely memories to share. But I must confess that I thought that the plane trip seemed just too tedious huh! All of that? Wow. Glad you still have a desire to return. Mark that map. Cancun. Belize: close to my heart. Thanks for sharing this. Blessings. Thanks for reading. Plane trip exhausting but worth the experience! Regards. Marie. Thank you so much, Sherron. What an excellent travelogue! You made me want very much to go there. Thanks for sharing your wonderful trip.